All the lunar-phobes out there, as well as many of the astronomically challenged – like me, will be praying for clear skies for the night and pre dawn hours on Sept. 27-28. The total eclipse of September’s Harvest Moon (so called in the Northern Hemisphere because it is the full moon closest to the autumnal equinox) will bring an end to this latest, gasp, lunar tetrad. Now a lunar tetrad is a series of four total lunar eclipses in a row, spaced six lunar months or five full moons apart, with no partial eclipses in between. Lunar tetrads are normal astronomical events unless you are of a particular apocalyptic bent – then they are a sign of the “end times.” But the Earth has seen more tetrads than end times so I imagine the kids will have to go to school on the 28th. Normal astronomical event doesn’t necessarily mean common astronomical event; there can be centuries between lunar tetrads. The most tetrads that can occur in any century is eight and there will be eight this century. The last time that happened was in the 9th century. The sequence for this lunar tetrad began on April 15, 2014 with total eclipses following on Oct. 8, 2014, April 4, 2015 and upcoming on Sept. 27. And, in case you miss this one, mark your calendars, the next lunar tetrad of the 21st century will begin on April 25, 2032. Conspiracy theorists are right about one thing though – these lunar eclipses are always preceded (by two weeks) or followed (by two weeks) by solar eclipses. There was a partial solar eclipse last Sunday, Sept. 13. These are shadow games after all; solar eclipses are the shadow of the moon passing between Earth and the sun; lunar eclipses are the shadow of Earth passing between the moon and sun; so it makes sense that they occur when the orbits of these orbs are aligned and that happens twice during the lunar month. And it gets better – this is no ordinary moon that will be eclipsed – it’s a “supermoon.” It appears moons didn’t become “super” until 1979 when astrologer Richard Nolle coined the term. Nolle defined the term as “…a new or full moon, which occurs with the moon at or near (within 90% of) its closest approach to Earth in a given orbit (perigee). In short, Earth, moon and sun are all in a line, with moon in its nearest approach to Earth.” Scientifically it’s a pretty vague term with lots of latitude and means that the moon is close (relatively speaking) to Earth and will look big. Astronomers would call this Harvest Moon a perigee full moon – perigee is the closest the moon will be to Earth in any given month. We have to step outside of science once again to get to the last qualifier for September’s celestial event. It will not only be a full moon and a super full moon at that – it will also be a “Blood Moon.” This is another apocalyptic reference seemingly coined by a couple of evangelical pastors who purport that this particular tetrad of “Blood Moons” means God has big changes on tab for the planet. Astronomers, on the other hand, often talk about the moon looking red or blood red during a total eclipse. But what they are talking about is Rayleigh scattering – the term used to describe, in the case of a lunar eclipse, the fact that the Earth’s atmosphere bends or refracts the sun’s light, directing the red part of the spectrum towards the moon resulting in a blood red moon. 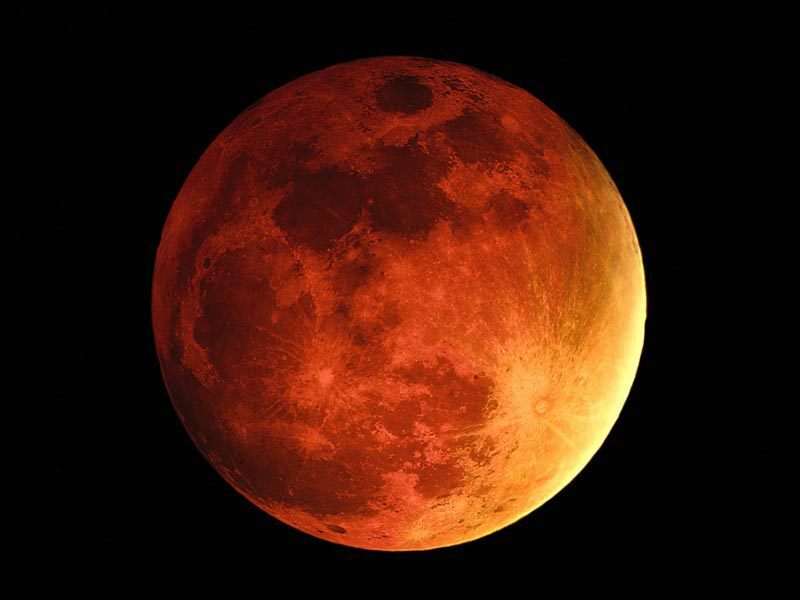 The super end to this bloody full moon tetrad should begin with a partial umbra eclipse around 9:07 p.m. EDT, Sept. 27 and the total eclipse beginning around 10:11 p.m. EDT. The total eclipse should be at its peak about 10:47 p.m. EDT. So keep the kids up. If it is the Apocalypse they’ll probably want to see it. Even if it’s not, it will be a really cool event and worth going to school a little groggy on Monday. Here’s hoping for clear skies! An enlightening article and well written for the lay person to grasp. On a personal level, I am grateful to the author for a new understanding of why my older born-again sibling keeps ranting about the end of the world coming in September 2015.